Hi, Good Morning, Thank you, friends and viewers. 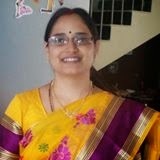 Today I will post how to make thotakura masala curry Recipe. This is another simple and easy curry to accompany with rice or roti. We can make different varieties of curry and also pulusu (stew) with this leafy vegetable. I have already posted thotakura vadiyalu curry, thotakura undalu and thoTakura pulusu. we can make ava pulusu(stew with mustard masala) also with it as we do with bachalakura ava pulusu. This leafy vegetable is good for digestion. Thotakura Masala Curry -- An accompaniment to rice or roti. Discard the leaves from stem, chop it well and wash it under running water. Chop onion and tomato. Peel garlic. Heat oil in a kadai, add mustard seeds, cumin seeds and red chilli. When it started spluttering add curry leaves. Add onion and tomato one after the other. Fry them till they become mushy. Add thotakura/amaranthus and mix it well. Saute it well, and add salt, turmeric powder. Sprinkle little water and cover it. Let it cook for 5 to 10 minutes.This vegetable cooks very fast, so keep an eye on it. Once the leaves get cooked and water evaporates, add red chilli powder and garam masala. Saute it well till the curry absorbs all the water and let it NOT dry completely. It is neither gravy curry and nor stir fried one, but looks like amass. 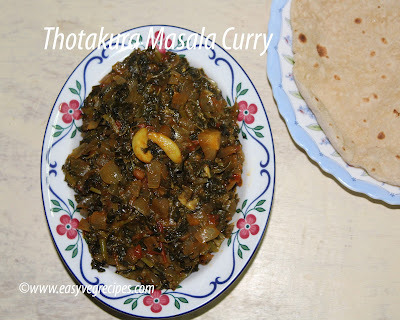 Serve thotakura masala curry with rice or roti.